The Mo Ibrahim Foundation awarded its prize for African leadership to Ellen Johnson Sirleaf, the former president of Liberia. The foundation’s prize committee stated that Sirleaf had shown exceptional leadership, and noted that Liberia was the only African country out of fifty-four to improve in every category of its Index of African Governance. While it did acknowledge that Sirleaf has been criticized for tolerating corruption, it noted that her leadership had nevertheless been exceptional under difficult circumstances following a generation of civil war. Mo Ibrahim, a British-Sudanese telecom billionaire, established the prize in 2006 to recognize African leadership. Eligibility is restricted to African democratically elected heads of state or government who served the constitutionally mandated term of office in the past three years and demonstrated outstanding leadership. It is probably the richest international prize in the world. It awards laureates $5 million over ten years, then $200,000 per year for life. In addition, laureates may apply for an additional $200,000 per year for their own philanthropy. The prize appears to have been designed to recognize and encourage African leadership of the highest quality and also to free former heads of state from post-presidential financial burdens. The selection committee numbers eight and is of outstanding quality: it includes former president of Ireland Mary Robinson, former first lady of both Mozambique and South Africa Graca Machel, and former president of Botswana (and laureate) Festus Mogae. The prize may be awarded annually, but it has been awarded only five times in the ten years since it was established, including this year. The other recipients are Joaquim Chissano (former president of Mozambique), Festus Mogae (former president of Botswana), Pedro Verona Pires (former president of Cape Verde), and Hifikepunye Pohamba (former president of Namibia). Johnson Sirleaf was by no means without controversy during her long career in Liberian politics. She appears to have been much more popular outside of Liberia than at home. Her chosen candidate to succeed her in the most recent elections was defeated, and her political party recently expelled her from membership for reasons that appear to be both local and obscure. 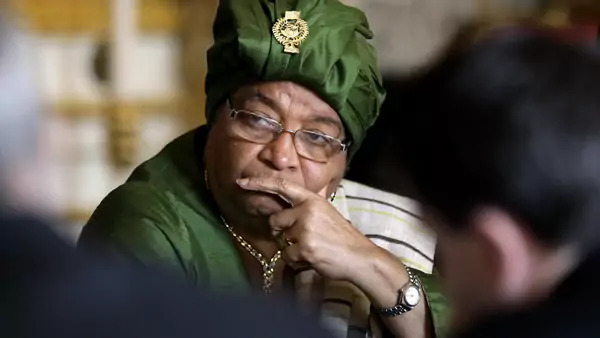 That she was the first woman to be elected as a chief of state in Africa and was therefore also probably more important outside of Liberia than at home. Her record is undoubtedly mixed, but her success in guiding the country out of a generation of civil war should not be taken for granted.